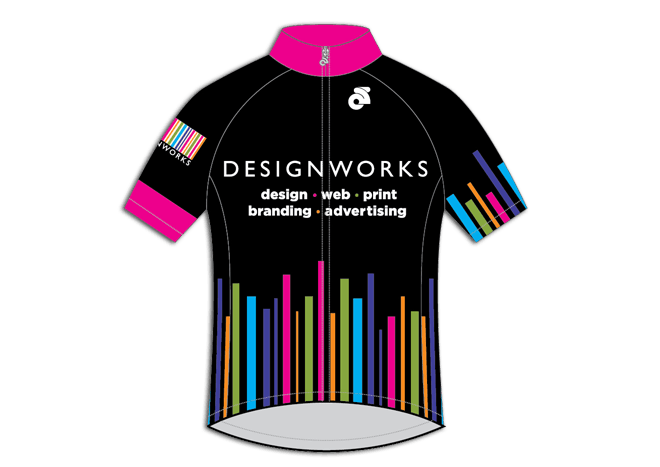 We’re pleased to announce the launch of a branded cycling kit for Designworks. The cycling kit design uses the striped ‘bar code’ of our logomark to create the profile of a mountainous route, similar to the hilly profiles on local rides out to the Lake District and Yorkshire Dales. The vibrant brand colours are enhanced on the black background and provide added visibility. Our logo, services and web address are all clearly displayed on the lycra to ensure we get noticed when we’re out on the road.